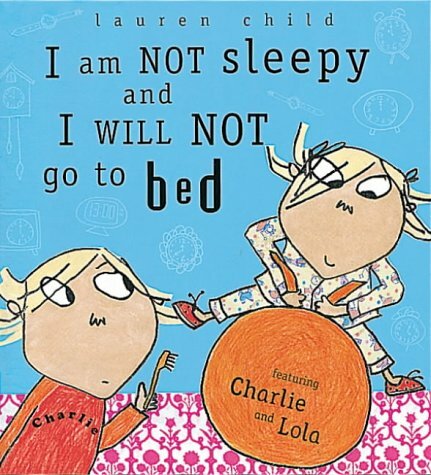 The long suffering Charlie and his hyperactive sister Lola, familiar from I will not ever Never eat a tomato, return in a new book celebrating Lola's extravagantly imaginative avoidance behaviour at bedtime. Before Lola can be cajoled into bed, Charlie has to negotiate with thirsty tigers, a hungry lion, whales in the bath and pyjama-pinching dancing dogs. This is a satisfying little story in large picture book format that should appeal to both sleep-defying toddlers and their baby-sitting siblings. The visual impact of the book is cheerfully garish. The characters are depicted in a lively scrawl against flat blocks of colour broken by scattered items of photomontage, the overall effect being as hectic as Lola's hallucinations.